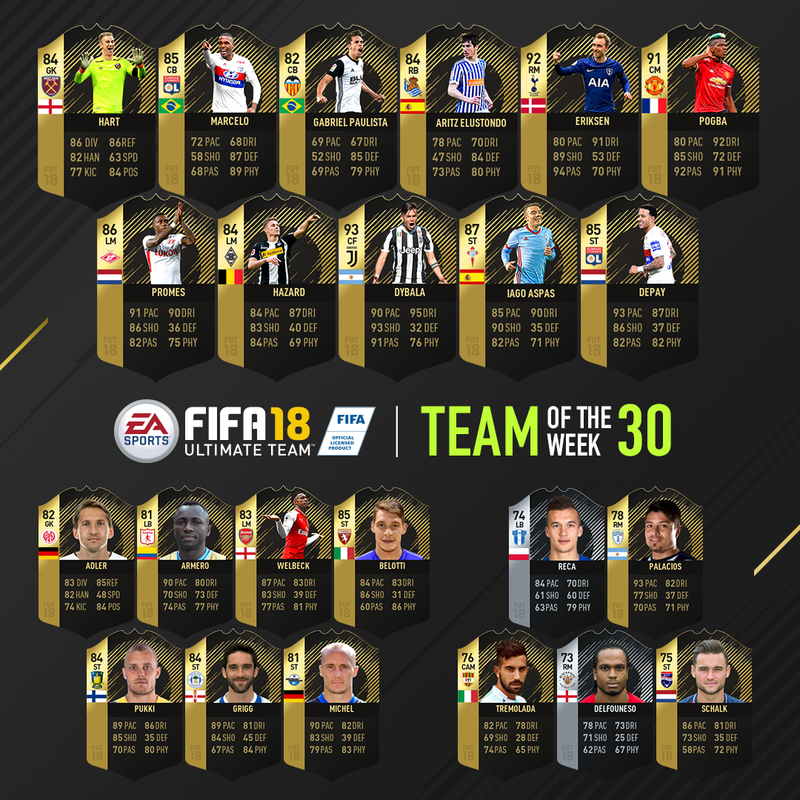 Paul Pogba leads this week's FIFA Ultimate Team of the Week after his Manchester derby heroics. The France international, who has regularly been criticised throughout his spell at Manchester United, scored twice in three second-half minutes as United came from 2-0 down to beat Manchester City 3-2 and deny their fierce rivals the Premier League title. And EA Sports has recognised his excellent contribution, boosting him from an 88 rating to a 91 rating. Fellow midfielder Christian Eriksen also scored twice, for Tottenham against Stoke City, though his second goal - scored from a free-kick - has been the subject of much controversy, with striker Harry Kane insistent that the ball touched him before going in. Of course, Kane remains in the chase for the Premier League Golden Boot. Nevertheless, Eriksen has received a position change to RM and a boost from 87 to 92. Elsewhere, Paulo Dybala receives a boost to a 93 to be the highest-rated player this week, after scoring a hat-trick in Juve's 4-2 win over Benevento. Arsenal's Danny Welbeck makes the bench after scoring in Arsenal's win over Southampton, while Joe Hart keeps goal in the starting XI after an impressive performance in West Ham's 1-1 draw with Chelsea.